It’s one thing to adhere to a “live with less” philosophy in the house. I don’t miss having cabinets full of dishes we never use, and nine months into this gig I’ve forgotten some of the possessions that are stowed in the Abominable Storage Unit because I JUST COULDN’T BEAR to part with them. 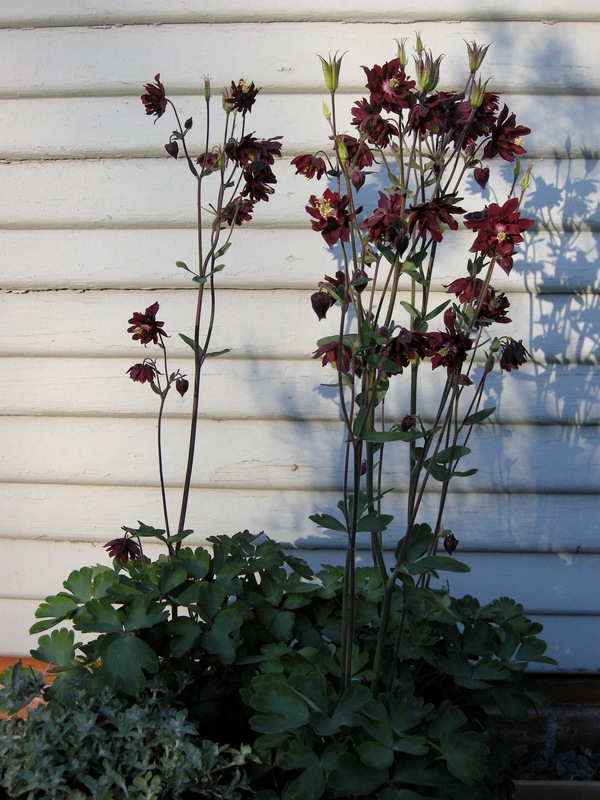 But limiting the palette in the garden – now, that takes some serious restraint. 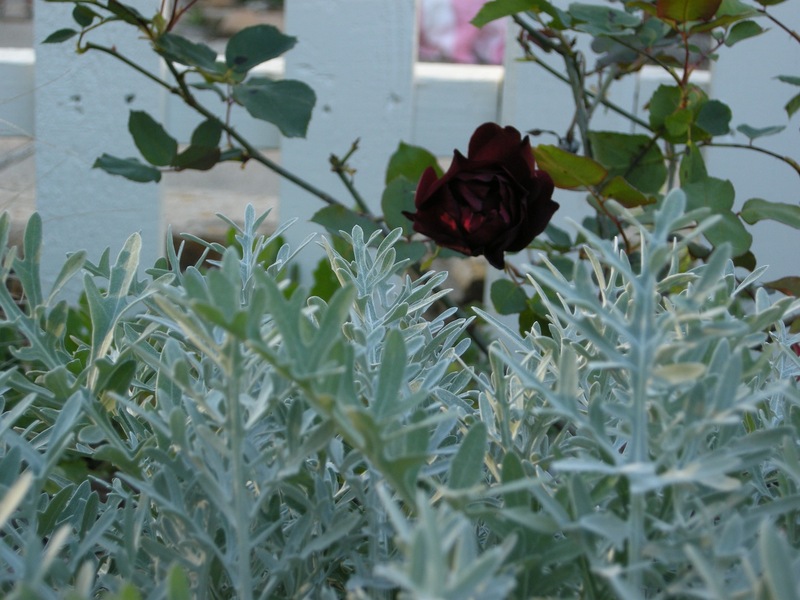 One of the things we love about the little house in Brenham is the color it’s painted – a soft gray-blue that also happens to be one of my favorite plant colors. So from the beginning, I had in mind to keep the front beds, at least, to a very strict color scheme using silver-blue, peachy-apricot and burgundy. 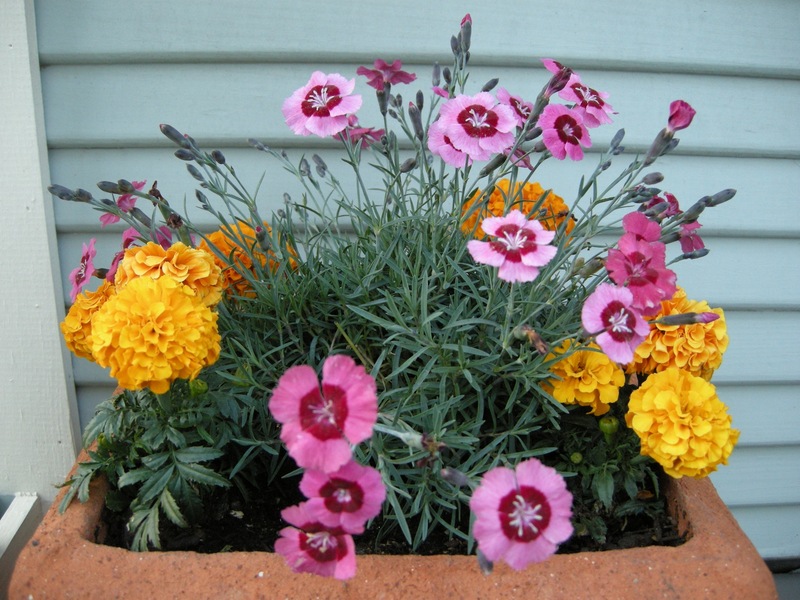 A little bit of a cheat: a pot of dianthus and marigolds. 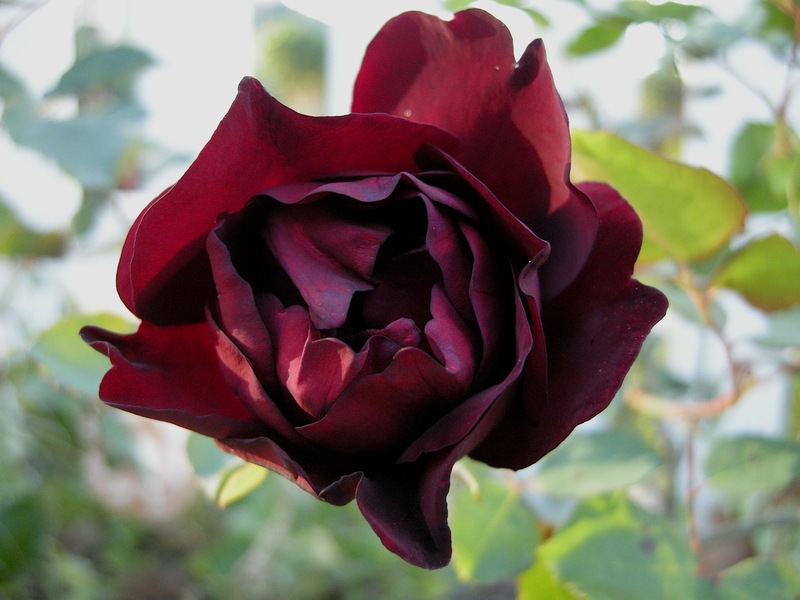 The roses – typically my foundation plants – were easy choices, including ‘Frances Dubreuil’ (burgundy), ‘Adam’ (creamy peach), ‘Winter Sunset’ (another peach), and ‘Star of the Republic’ (another peach!) along the picket fence; ‘Crepuscule (golden apricot) on the arbor, ‘Maggie’ (deep cerise) on a tutor and ‘Jude the Obscure’ (cabbagey peach) who required yet another bed to be dug. 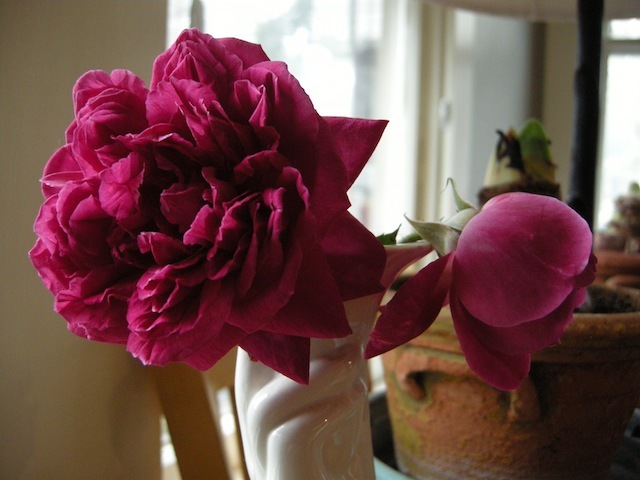 ‘Abraham Darby’ may yet be moved from the back yard to join them. 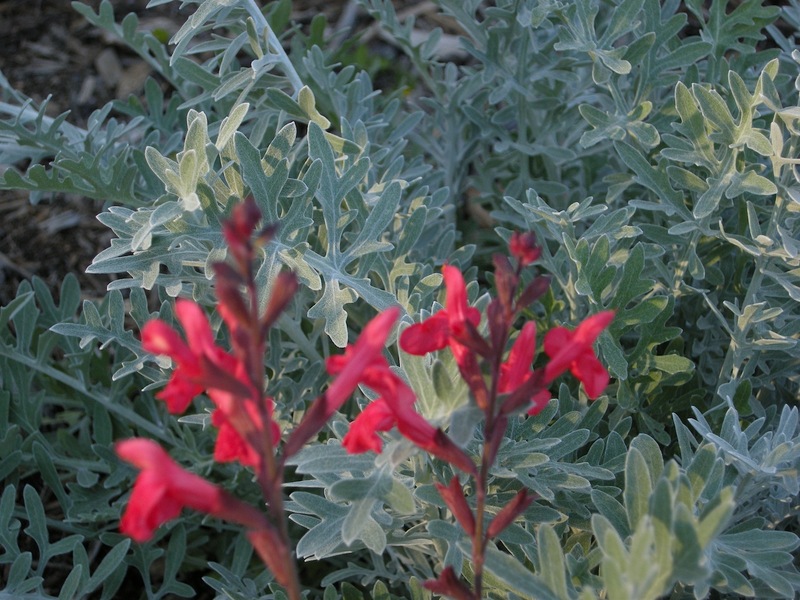 Plays nice with salmon-colored Salvia Gregii, too. 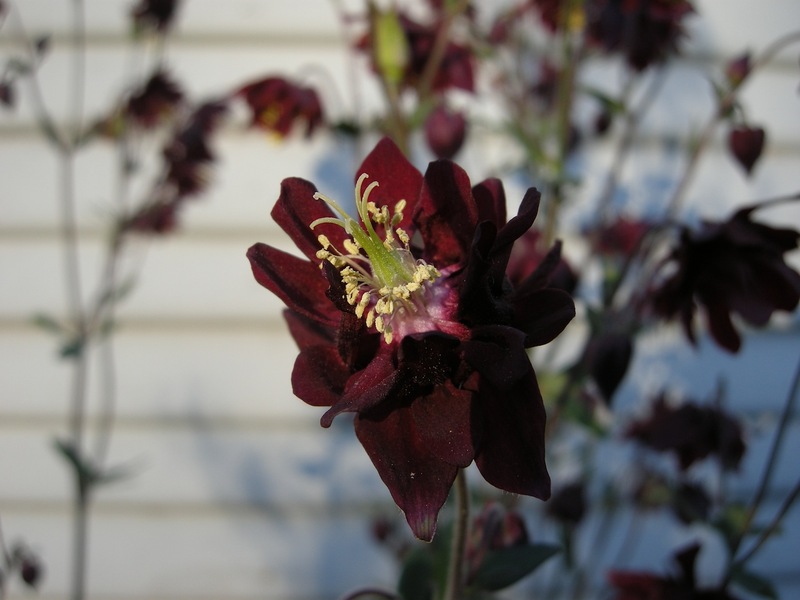 I love ‘Frances Dubreuil’ so much I’ve turned up the burgundy a notch with two new finds: ‘Ruby Port’ Columbine – amazingly rich little flowers dancing on skinny stalks, with buds that look as exotic as ancient, elongated tulips – and Indian Feather ‘Passionate Rainbow’, a guara that at least for now has burgundy leaves. You want just enough of this color to add depth but not so much it looks like a goth party. This isn’t The Addams Family garden! 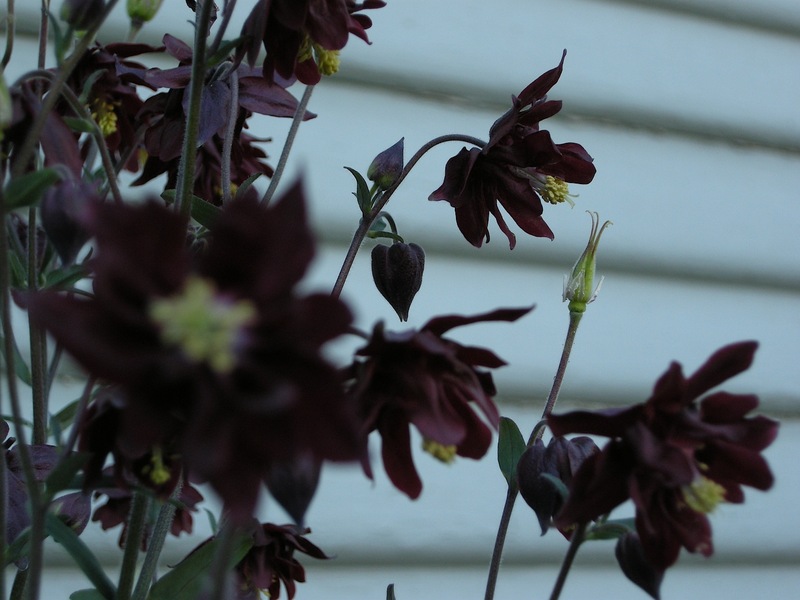 ‘Ruby Port’ Columbine (aquilegia) before planting. Not sure it will thrive in our climate, but how could I resist? And if I want to build on the palette, the lime green and soft yellow are good candidates. This entry was posted in Garden and tagged 'Adam', 'Grand Primo' Narcissus, 'Jude the Obscure', 'Maggie', 'Ruby Port' Columbine, 'Star of the Republic', 'Winter Sunset', Artemesia 'Colchester White' on March 15, 2013 by Molly Glentzer.